I just thought I'd take a bit of time to input these very helpful links that I've accumulated over the past few months while researching our upcoming hike up the MR. Many thanks to everyone who have shared their stories, pictures, advice, etc...your inputs have been invaluable. It has been sad to see the board take a rather adolescent turn lately, due to just a few people. I worry that the board will be shut down again and people who genuinely NEED the type of information this board provides will have to go without. Maybe it is a bit dramatic to say it, but who knows..maybe that will cost someone their life in the end. 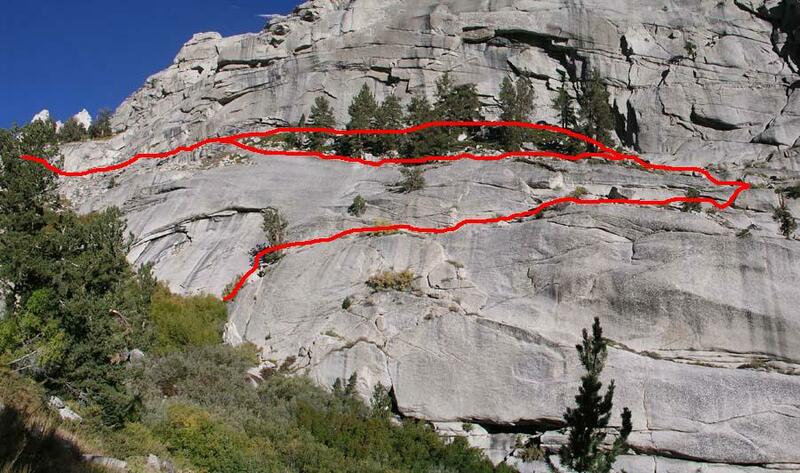 Note: Best overview picture of the Ebersbacher Ledges is below. "Routes I've done above The Notch"
Mt. Whitney "Loop trip": Up the Mountaineer's Route, Down the Whitney Trail. That's about it. I know I missed a bunch. Some of those up there are Bob R photo albums...they are excellent. Snow Nymph, 2004 is also particularly good (Snow Dude & Snow Nymph) because they have marked up some of their photos with great route-finding lines. I used several of the sites above to print out pictures on 4 x 6 photo paper, stapled them together and now have them as a "trip book" to help me visualize the route when I'm up there. Yes I'm a n-e-r-d. Thanks again to everyone that took the time to post their pictures and stories..we are really looking forward to our trip and I hope these links might help others interested in making this hike. This is an excellent post. Just the kind of thing this board excels at. Thank you very much for taking the time to compile these and share them with the rest of us! Just to be safe. Like you, I'd hate to see the trolls win and lose such a great resource, but it'd probably be good to cover the bases. Maybe Richard could even make it "sticky" for you so it doesn't drift off the bottom, or perhaps you could post under the "Links to Other Information" thread, which is already set as "sticky"? BTW, do you have the link to the MR DVD web site in this list? I didn't take the time to do a thorough link by link review. That would be really good to have as well. Thanks again for taking the time to compile this and share it with everyone. Hope your upcoming trip goes great. Let us know how it went! p.s. Really, really cool job you have there. My wife always wanted to learn to fly, so one day I drove by the general aviation airport in our neck of the woods (Fullerton, CA) and signed her up for lessons. She was training in a 172. Her instructor was kind of pushing her too hard to solo, though, and she was really, really not ready. That, and the cost finally put a (temporary I hope) stop on the training. The FBO had a KingAir - way cool. They kept promising to take us along on a flight, but never happened. Did get to go up in the instructor's Barron though. Awesome! Thanks CA...although the real thanks goes to everyone that posted their fine photos and trip reports! I'd be happy to post the same message over at Richard's place...good idea so it doesn't get lost if the board goes back down. I'll add the MR DVD to the list too..good suggestion! As for the job..I'm extremely fortunate to do what I love for a living. Flying has been a great career path for me and I enjoy going to "work". I was (and am still) a CFII..it's a shame your wife's instructor pushed her so hard to solo. It's all about being comfortable and learning at your own comfort level and pace (just like hiking!). If she ever decides to get back into it go ahead and "interview" several CFI's and find a good match. And if you ever have any questions feel free to e-mail me. That photo is an "optional" section further down canyon from the typical E-Ledges. It involves a bit more risk than the typical ledges. Notice I had my hands in my pockets. While you need to be a bit careful on the ledges it's really not that bad. Great post and information. Thanks. Nice job BeachAV8R! I have one comment, you may want to include a couple of Rick Kent's albums in the picture list. He has some great shots of the MR during winter conditions. and the other was from last April (Rick Kent April '05). thank you so much for pics on "Snownymph, 2004"!! Those detailed pics of the last few hundred feet help out SO MUCH! I'm much more confident now, in doing that route this summer for the first time. I did the main route last year, for the first time, because i was solo and didnt know the mtn that well. My friend tried to talk me in to doing the MR route and was disappointed when i didnt. I should've trusted him and gone. oh well...I'm going for it this year with so much excitement. That sort of climbing (class 3) is right up my alley! I've been looking all over the place for those kind of detailed pics. I got the link from summitpost. Like Denise, I'm thinking of doing the MR for the first time. I too thought that BeachAV8R's link Picture Site 13 of Snownymph's pictures of herself and Snowdude doing the MR are very informative. Could Snownymph or someone else compare the risk when going down the highest part of the MR to going up it? Any advice? Thanks. "Could Snownymph or someone else compare the risk when going down the highest part of the MR to going up it? Any advice?" 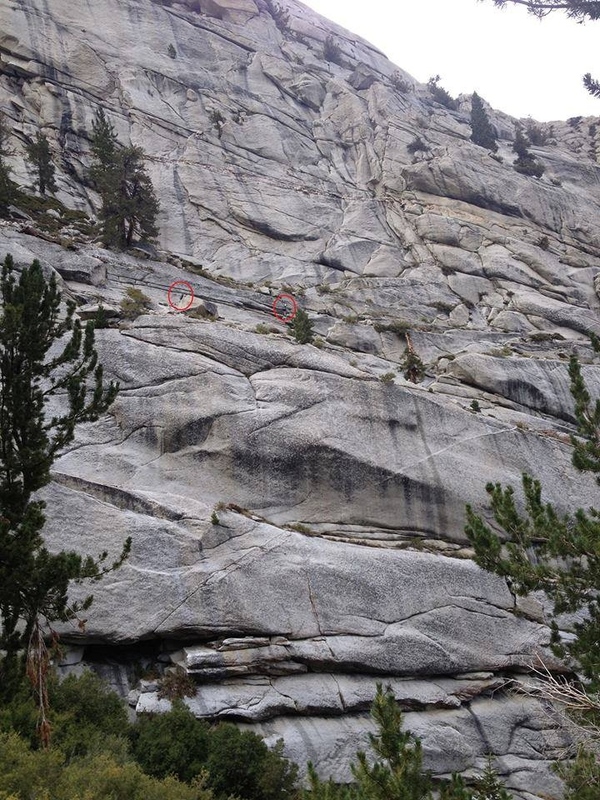 I'll give it a try - First, there are many routes up the chute and multiple chutes. Most people find the easiest one to be the very first chute at the top of the notch and the easiest line to be i) start up on the left side just above the notch, ii) move over to the right side about midway (there is usually a small snow/ice patch or field there) and iii) continue up the right side until reaching the summit ridge. Bob R has previously posted pictures of this route with lines drawn on the pictures to show the route. Second, mark the spot where you leave the chute on the summit ridge so you can downclimb the same way you come up (I find people often forget after a half hour on the summit). Also, many others may be doing the same thing with cairnes, so be prepared to find a recognizable way to do this. 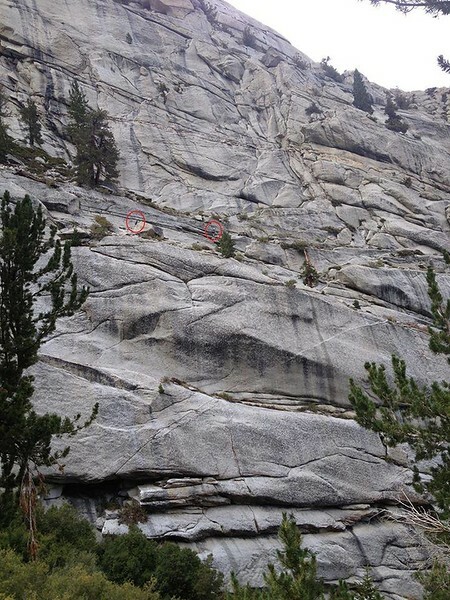 Third, the hardest part of the chute downclimb for most people (depending on what line you take) is usually the very last (bottom) section above the notch. This varies based on how much snow there is with higher snow levels making it easier. Fourth, bring a short length of climbing rope (50 feet should be enough), so the stronger climber can belay the weaker one, if necessay. You may never need to take it out of your pack, but it could make the difference in safety and confidence for some people. And here is the best picture of the Ebersbacher Ledges. Click on it for the full-size version. It is recommended to take the higher route through the trees. Generated in 0.064 seconds in which 0.039 seconds were spent on a total of 14 queries. Zlib compression disabled.